Amid the hustle and bustle of holiday activities, don’t forget to make a note of campus winter break closures and reduced hours. For University of Oregon students and many faculty members, winter vacation runs Dec. 8-Jan. 6. The law school’s final exams finish Dec. 19. The Office of Human Resources provides guidance on paid holidays for various work groups and how time off will affect staffing. More parking spaces will be available, but all campus lots will be patrolled as usual. The Department of Parking and Transportation will be closed Dec. 24-25 and 31 and Jan. 1. Campus Planning and Facilities Management has information on holiday closures and major projects, including Hayward Field and Knight Campus, on the department’s notification map. Contact the office in regards to building closures. Take care not to leave smelly trash in work spaces over the holidays. The Zero Waste Program will be closed Dec. 24-26 and Dec. 28-Jan. 1. Limited staff will be on hand Dec. 27 from 9 a.m.-3 p.m. The contact that day will be at 541-514-5814. The Erb Memorial Union will operate with scaled-back hours and will be closed on weekends starting Dec. 8. ID Card Services will be open Monday through Friday, 9 a.m. to 4 p.m. from Dec. 10-21. The passport acceptance center will be closed Dec. 17-Jan. 6. From Dec. 22-Jan. 1 the EMU will not be open. The weekend before winter term begins, the EMU will reopen Saturday, Jan. 5 at 8 a.m. Not all vendors and services will be open during the times the EMU is open. Refer to the website for the latest schedule. For campus dining options, all residence hall dining venues will be closed starting Saturday, Dec. 8, with limited options reopening Jan. 5. See the food on campus map to find other campus coffee spots and EMU restaurants, including their hours. Holiday party planners should be aware that Catering and Conference Services will be closed Dec. 24-26, Dec. 31 and Jan. 1. The University Health Center is open for patient care Dec. 10-14 from 9 a.m. to noon but will be closed to patients Dec. 15-Jan. 6. Administrative closures will be Dec. 24-25 and 31 and Jan. 1. The dental clinic will also have special hours. The University Counseling Center’s after-hours support and crisis line is always available at 541-346-3227. The University Testing Center is closed on UO-observed holidays and Dec. 24. Additionally, due to construction, the north entrance facing 13th Avenue will be closed Dec. 17 through October 2019. Visitors should enter via the south door near the basketball courts. Check out holiday books and movies before the Knight Library closes Fridays-Sundays starting Dec. 8. Open hours resume Sunday, Jan. 6. 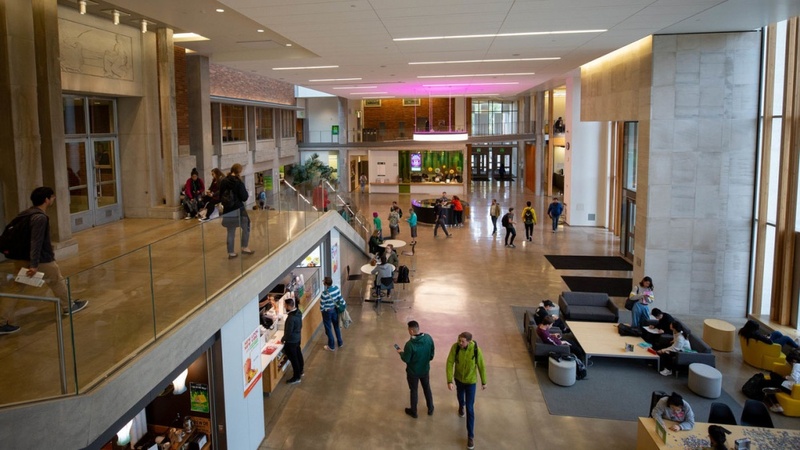 Other libraries will follow a similar schedule, including the Price Science Commons, design library and UO Portland. Special Collections and University Archives will operate with reduced hours and weekend closures, while the math library will be closed for four weeks. The Technology Service Desk will be closed Dec. 24 and 31. Otherwise it will continue to operate Monday-Friday, 8 a.m.-5 p.m. but will suspend its evening phone hours Dec. 12-Jan. 2. The last day of normal operation for the UO ride programs is Dec. 6. All programs shut down Dec. 7 and will restart Monday, Jan. 7. Ride-hailing services will operate as usual, while some Lane Transit District buses serving campus may have limited schedules. Plan preholiday workouts around the Student Recreation Center winter hours. It will be closed weekends starting Dec. 8, including extended closures Dec. 22-25 and Dec. 29-Jan. 1. The boxing studio and racquetball courts 1 and 2 will be unavailable until winter term 2019. Please refer to the website for a complete list of modified hours. The Duck Store campus location will be closed Christmas and New Year's Day, while the store at the EMU is closed Dec. 24-Jan. 1. Winter term starts Monday, Jan. 7.